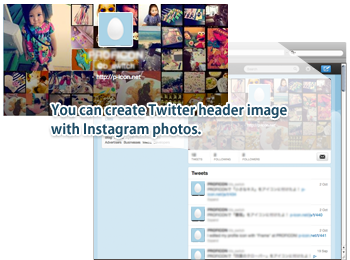 Use InstaHeader to create Twitter header image with Instagram photos. It's easy, and completely FREE. No need to register- simply sign in with your Twitter account. Specify your own Instagram photos simply by typing in your ID. You can also use public Instagram photos, selecting them by Category or Tag. 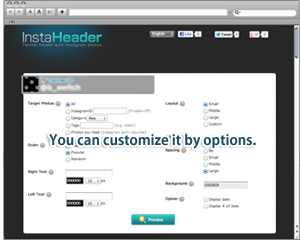 *Note: you do NOT have to be a user of Instagram to create a header image with InstaHeader! 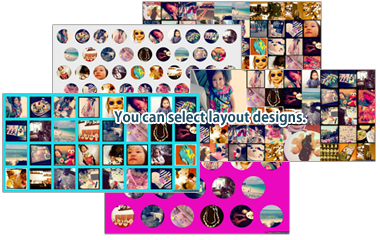 You can select from various layout designs. There are various layout settings you can select. Try and create your original header! 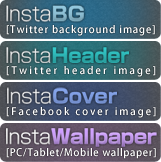 Everything about InstaHeader is easily customizable! Choose photo sizes, spacing and background colors. You can add own text message, too! Use our Live Preview feature to get your custom Twitter header perfect for you!